During my first year of seminary my field education assignment was to go to different churches throughout the year. Each church we would attend for four weeks and then we wrote a reflection about our experiences. We were assigned to go to large churches as well as small ones. We attended Lutheran, Catholic, Presbyterian, and Baptist churches. So we had a nice variety of experiences. It was weird not having a consistant worship experience at one church but it was also a very enjoyable experience. I learned a lot especially when it comes to hospalitity in a church. I learned that it did not matter if you had the right projection screens, or just a plain paper bulletin, it did not matter if the pastor was dynamic, or kinda boring. It did not matter if it was a small choir or professional singers, what matter to me the most, what connected me with the church that I was attending was personal interaction with church members. As a pastor I recognize when a visitor comes to our church I actually become excited, I want to find out all there is to know about that person (this is actually true for anyone I meet). I am excited to talk with them after church, I can’t wait until they come out of the sanctuary. However I know as someone who has visited many churches, this is something that anyone would expect from the pastor. What has impressed me the most is if there were one or two people from the congregation who showed interest in me and my family. What if we welcomed people as if we were welcoming Jesus Himself? What if we welcomed people inside and outside of the church like we were welcoming Jesus? Now this would include our incompetent co-worker, our annoying family member, our emotionally needy friend, the homeless person on the corner, the clumsy clerk at the grocery store, the slow driver on the freeway, the person texting during a movie, or the off-tune person singing next to us at church. This is hard, I actually witnessed the complete opposite of this as I worshiped at an affluent church and a homeless person tried to attend a worship service. Though he was creating no disturbance, he did not look like the other people in the congregation, he kinda smelled and when he sang he was much louder than everyone else. Right away you could tell that he was not welcome. The ushers tried to get him to leave but he refused, eventually they threatened to call the police — he left on his own. I couldn’t help but wonder if they hadn’t unknowingly ushered Jesus out of their church. It is in showing hospitality, we are not welcoming one individual but we are welcoming a community who sent that person, we are welcoming generation after generation of individuals and all that they represent. Therefore, we are welcoming a disciple of Jesus and in fact, the presence of Jesus himself and the one who sent him, God the Father. 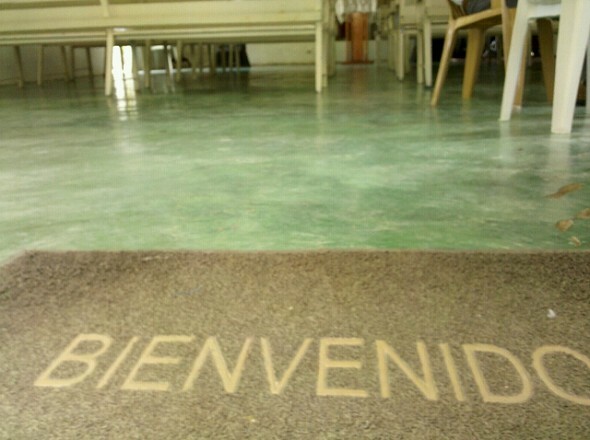 When was the last time you welcomed someone? When was the last time you felt welcomed?